The upcoming Tristania album, to be released in a few months’ time, will be a conceptually strong one. Not in the sense that there is one central theme, but in that nothing has been left to chance, and that the band has stretched themselves to achieve consistency on all levels. In the music, lyrics, band-wise, there’s a sense of direction and of everything coming together. This will in particular be reflected in the artwork of the new album. This time around, the band has the honor of working with Israeli artist Eliran Kantor, the fountainhead of a not insignificant amount of ingenious album art. 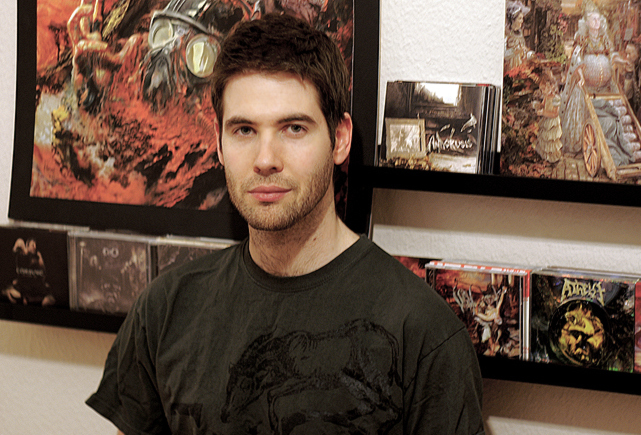 The Berlin-based artist, specialist on dark, disturbing imagery with a twist, is a sought-after designer of music artwork and has created pieces for bands like Testament, Atheist, Virus and The Old Dead Tree, to mention only a few. From the start the band wanted the cover design not only to capture recurrent ideas in the lyrics, but also to express certain moods: they wanted something dark and gloomy, dirty, organic, disturbing and a bit creepy. These notions also seem to define Kantor’s work, which is all of this and more, “unexpected” perhaps the most prominent feature that the band did not articulate originally. The band presented some initial ideas, and Kantor, translating the ideas into something tangible, came up with a visual concept that essentially nailed the band’s visions for this record. Tristania are very excited that Kantor did not only want to collaborate with the band, but also made an effort to try and gain their perspective. As this is being written the artwork is still being sketched out, but Tristania are more than confident that the final design will match all their expectations – and then some. This entry was posted in News and tagged album 2013, cover, cover art, Eliran Kantor, Israeli artist, may 2013, new album, tristania. Bookmark the permalink. actually it must be said that even though mariangela is astonishingly beautiful per se, the cover of rubicon sucked, as did the ones to illumination or world of glass… i can’t stand album covers with the singer on them (and sadly it often happens when the singer is a woman), as if he/she were all the album is about. Great artwork. Music is what matters in the end, but of course we cannot ignore the art, cover, concept, etc. I agree with andrea, I don’t like covers with just the singer on them (they are beautiful, but I think they are not expressive as they could be).